Aerogel is the lowest-density solid material that exists. Made almost entirely of air encapsulated in an ultra-light silica matrix, this man-made substance also has superb insulating abilities and has been used by NASA in spacesuits, space shuttles, satellites, and other stellar applications. It’s some pretty cool stuff—the aerogel Wikipedia page has some striking photos that demonstrate its remarkable properties. Aspen Aerogels of Northborough, Mass., is the largest private developer of commercial aerogel applications. Among other things, they have used aerogel for industrial purposes and as window and home insulation. Aerogel has also appeared intermittently in outdoor equipment, including a few winter boots, gloves, water bottle cozies, and sleeping pads. Now it may be on the cusp of becoming available in clothing as well. The potential revolution is this: Unlike goose down or synthetic insulations, aerogel does not need to be nearly as puffy (or lofty) in order to provide the same amount of insulation. 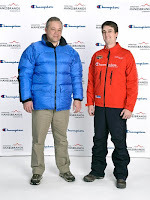 Last month, Hanesbrands—yes, that venerable maker of underwear—introduced the Champion Supersuit, a jacket and pants combo that use aerogel as its insulation (pictured next to a traditional down jacket). This spring, it will be tested on a summit bid on Mount Everest—you can follow along on their designated Expedition Hanesbrands web site. According to the company’s press release, the 3mm layer of aerogel provides the equivalent warmth as 40mm of goose down loft. It also can be compressed without loss of insulating ability. The new Supersuit is made of four layers. An outer windproof, waterproof layer keeps out the elements. Beneath that is 3mm of Zeroloft, a commercial brand of aerogels produced by Aspen Aerogels. The inner lining of the jacket contains two layers: a “metallicized foil membrane” that reflects radiant body heat and a moisture-wicking polyester inner layer. No word yet on whether the Supersuit will be available to consumers—or at what price.